We must say that normally by the time Ultra Music Festival begins dropping its lineup, the demands from fans have reached a fever pitch. Maybe people have been a bit preoccupied with everything else going on lately, but Ultra’s decision to drop their 2017 Phase 1 lineup today took us completely by surprise and we love them for it. The lineup features Live and DJ headliners, although we assume there are many more headliners to come in Phase 2. 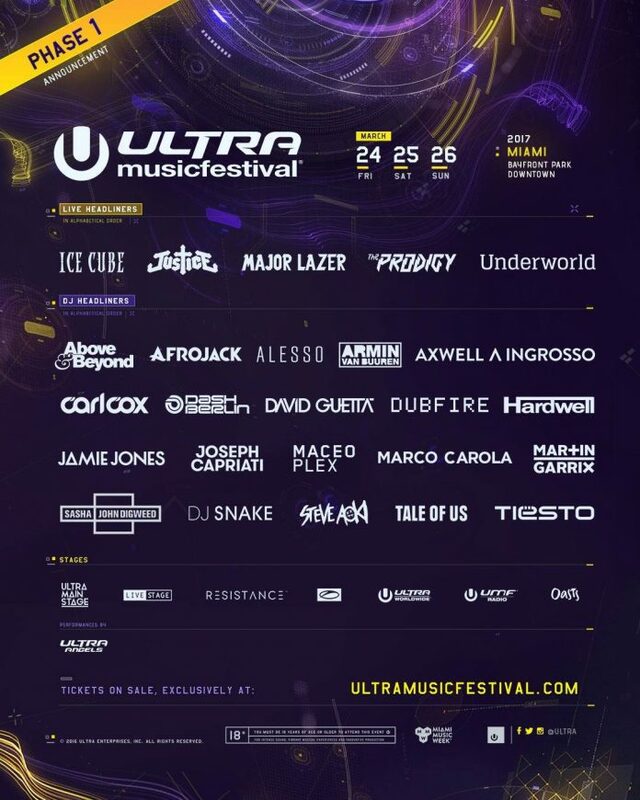 As always Ultra features a host of legends like Justice, Above & Beyond, Armin van Buuren, Axwell Ingrosso, Hardwell, Jamie Jones, Carl Cox,The Prodigy and Sasha & John Digweed. We haven’t seen Above & Beyond at Ultra since their epic rained out set from 2014, and they will be a welcome returning face this year. In a surprising selection, Ice Cube will be playing the Live Stage. DJ Snake is also coming back after his epic debut in 2016, and of course the world’s new #1 DJ Martin Garrix will presumably be closing the festival on Sunday night. Check out the entire Phase 1 lineup below and start looking forward to Spring before you even buy your Thanksgiving turkey.